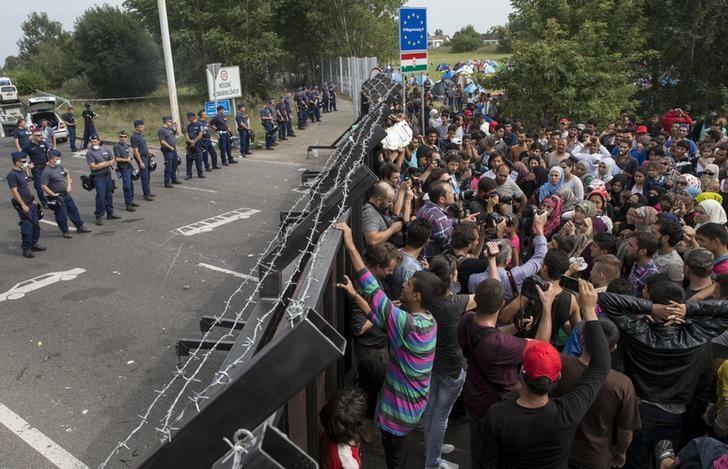 This image of the Hungarian-Serbian border comes via the International Business Times. In the following CNN report posted on 16 September 2015,the CNN reporter notes that the gates between Serbia and Hungary are guarded on the Hungarian side by terrorism/riot police. Soon after, the reporter mentions that “there are many women and children;” however, in a review of the footage shot, as many as 20 men can be identified per frame while only 1 woman (a reporter holding a microphone) can be counted. At the 32 second point, the first man wearing both a hoodie and a black mask appears (in an environment where the reporter and most of the other men are in short sleeves and sweating). Admittedly, there may be many children and women at the gate to Hungary. Just as the Palestinians set their rocket launch sites next to schools, the strategists among these people may be putting women and children in places where violence is most likely. However, when the tear gas and water cannons start, no children are seen fleeing. Few women (most of whom hold a microphone) run away at that point. At the 54 second point, several men with black bandannas pulled over their nose and mouth can be seen. At about the 1:15 point, three women (among an uncountable number of men) wander by the camera; however, because one is blonde, these may be reporters. At 2:42 (when the crowd starts reacting to what the reporter says is more tear gas), a man in short sleeves, an orange hood, and black mask runs past the camera. At 2:44, a man in a black mask and another in a green mask run by (while most men run by bare-faced). At 2:58, a woman walks past the camera. At 3:01, the men start chanting “Allahua Ackbar.” By 3:04, most of the men have a towel, shirt, or other cloth over their face. Still, the mask of the man who appears at 3:14 seems very reminiscent of the ISIS masks shown in the many execution videos. Likewise at 3:48, another man wearing what seems to be an ISIS mask runs past. It is telling that a CNN reporter is so focused on his view that the hundreds of men around him are “refugees” that he does not even comment on the possibility that this is an obvious invasion. In this Euronews report, crowds of “migrants” said to be “mainly from Syria, Iraq, and Afghanistan” attempted to push by police lines. In contrast to the CNN video above, this video shows women holding children on the front line (backed my many men behind). As noted by the reporter, the “migrants” refused to be fingerprinted. Much like the “Occupy” camps seen in America, the camp shown at the 47 second point looks more like a city dump than a campground. At the 54 second point, the “migrants” are seen trying to flee police. If you stop the video and count heads, you will find surprisingly few hijabs and children. Sadly, though, the number of people holding cameras obscures the true number of men there. Naturally, the UN with all its hoarded resources is urging the Hungarian invadees to clean up the camps that these invaders impose on their victim. Luckily, in the last frame, the “reporter” was able to find and photograph two females on one of the buses supplied by the Hungarian government. “The constant stream of refugees and other migrants from Turkey into Europe seems never-ending. Now the word is out: at least in this part of Eastern Europe, the border is closed. The Hungarian government erected a 100-mile fence and has now closed its border with Serbia. There’s no longer free passage for refugees. Mohammed, from Damascus, was recently married. He and his wife, like many other refugees, found safety in Turkey. Now he wants a better life in Europe. “Police sent (refugees) through a field to another crossing, but now, anyone who crosses without approval will be arrested. “At the border, the United Nation’s regional representative told CBN News while she believes Hungary can do more to help the newcomers, she understands the small country’s limitations. ‘I think they are making little effort; I think there is certainly room for improvement,’ UNHCR Regional Rep. Monserrat Feixas Vihe told CBN News. ‘But Hungary is a country that has some resources. They have certain capacities and the numbers that are now entering are so big that they exceed the capacities of Hungary,’ he said. Just before the border closed, CBN News found most of the migrants in good spirits. Some were thirsty from making their journey in the hot sun. Volunteers provided them with drinking water and food to eat. They stood in long lines for hours. Border guards compassionately assisted them as they boarded buses provided by the Hungarian government. Please note that Hungary has provided water, food, transportation (some at the same charge required of Hungarians and some provided free of charge to the “migrants”). Also note that ISIS promised early this year to invade Europe (as reported by the Daily Mail on 18 February 2015 and the Daily Beast on 17 February 2015). When Coptic Christians were martyred in Libya, ISIS promised to kill the pope. The majority of these migrants are young men who may now find the pathway to western Europe more difficult. Germany and Austria are also overwhelmed. They have tightened their own borders. So, why now? Why are the refugees leaving camps in Turkey, Lebanon, and Jordan? Has the international community failed them? ‘I don’t like to use the word failure, but I certainly think a lot more support is needed and it should be coming, you know, from everyone,’ Vihe said. In the meantime, with the Hungarian border closed, the migrants are likely to seek alternative routes through Croatia and Romania. Since this is the time of the haj, why aren’t these Muslims going to Mecca? Since these are primarily army-age men, why are they called “migrants?” Since ISIS terrorists have been arrested among these men, why isn’t this seen as an invasion? Hijrah is the Islamic doctrine of migration, which is a form of stealth jihad. And whoever emigrates for the cause of Allah will find on the earth many locations and abundance, And whoever leaves his home as an emigrant to Allah and His Messenger and then death overtakes him, his reward has already become incumbent upon Allah. And Allah is ever Forgiving and Merciful. (Quran 4:100). And now, looking at Europe and America, a migration invasion of a much greater magnitude is underway. Evidence of that invasion came in February when an ISIS operative confirmed what many already suspected – the Islamic State is using the refugee crisis to form a fifth column of Muslim fighters inside Western nations. The Syrian operative claimed more than 4,000 trained ISIS gunmen have already been smuggled into Europe – hidden among innocent refugees, reported the Express, a British newspaper. Hungary’s prime minister, Victor Orban, was lampooned in the European media Thursday for writing an op-ed in which he stated Hungary was blocking the Muslim migrants to preserve its Christian heritage. But more European leaders should be as astute as Orban, says Clare Lopez, a senior Middle East analyst for the Center for Security Policy. Five men have been arrested as they attempted to cross the Bulgarian-Macedonian border with decapitation videos and Islamic State propaganda on their phones. The terrorist suspects had been posing as refugees. Bulgarian authorities near the Gyueshevo border checkpoint detained the five men, aged between 20 and 24, late on Wednesday, Bulgarian broadcaster NOVA TV reported. The men were stopped by a border guard, who they attempted to bribe with a “wad of dollars.” However, they were searched and Islamic State propaganda, specific Jihadists prayers and decapitation videos were found on their phones. In a move that suggests how seriously authorities are taking the case, the Bulgarian State Agency for National Security (DANS) has now taken control of the investigation under the supervision of the regional prosecutor’s office in Kyustendil. The men chose to cross in a wooded area, local media have reported, and took a car from an accomplice who had crossed legally from Macedonia with the vehicle.